This summer, I say goodbye to the countryside of Connecticut momentarily and find myself spending much of my time by the sea. My daily routine shifts from morning walks with Shiloh down wooded paths to seaside streets. I beach hop from Manchester to Beverly Farms, toting a bag with artisan sandwiches from Half Baked in Beverly Farms, a frisbee or equivalent type of activity, and an enticing summer read which at the moment is Shotgun Lovesongs. Sun-kissed, I enjoy returning home early evening ready for a refreshing cocktail and some fun and flavorful bites. 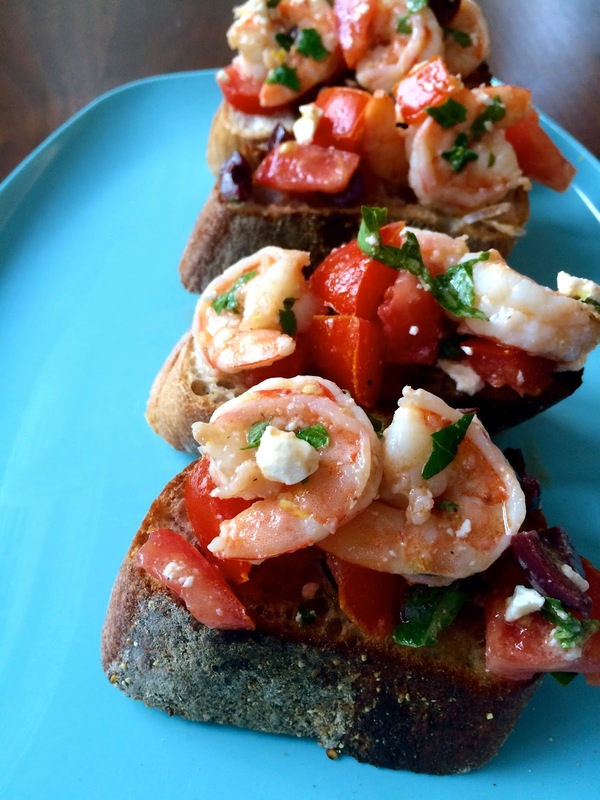 Marni and I have made numerous variations on the fresh and visually enticing summer appetizer, bruschetta. It’s quick and easy to assemble, beautifully adaptable and always a crowd-pleaser. The other night, I added my own twist to the Italian classic using some of my favorite Greek flavors. I sauteed shrimp in mounds of garlic and lemon and tossed in ripe, bursting tomatoes, some fresh herbs, and of course, lots of feta. Everything tastes betta with feta! In a saute pan, heat 2 T EVOO on medium-high heat. Add garlic and cook until slightly golden, about thirty seconds. Next add the shrimp and cook until pink and opaque, 4 to 5 minutes. Transfer to a small bowl and let cool slightly. Add the chopped tomatoes, herbs, lemon juice, remaining EVOO, kalamata olives, and feta to the shrimp bowl, toss and let meld for at least twenty minutes. Season with salt and pepper to taste. While I like the filling at room temperature, feel free to let the mixture meld in the refrigerator for a chilled version. While the topping is marinating, heat the grill to medium-high heat. Brush the baguette slices with remaining EVOO. Grill the bread until slightly charred, about 2 to 3 minutes on each side. Remove the toasts from the grill and arrange on a platter. Rub both sides of the baguette slices with the halved garlic clove. Spoon the shrimp mixture generously over and into each baguette slices. Garnish with extra feta and serve! While the grilled baguette smothered in toppings is delectable, you could also toss the flavor-packed topping in pasta or serve it atop bigger cuts of toast for a starter or lunch entree.